Here is the Easy Language code from TradeStation. And I had attempted to code the same in Amibroker AFL code.
} // plot on a subgraph separate from the price region. In the above charts Two Pole Butterworth Filter is applied and it shows how smooth the butterworth filter is. To check how smooth the filter is you can try and compare with other traditional moving averages like EMA, MA, WMA. Disclaimer : It is just a indicator and not a trading system the Buy and Sell Signals are added for the purpose of identifying turn in the filter. What is the procedure of adding AFL code in Amibroker ? Or Where can I found its procedure ? @chirag : Which Amibroker version you are using? I am using Amibroker 5.1 Ver. I have Downloaded your Two Pole-Butterworth-Filter-Amibroker-Afl-Code, but it is showing error 29. Pls rectify and give it at your earliest will make many of them with a Great Joy. Also God Bless YOU for your help without expecting anything from the readers. Keep it up. I pray to God “May All Your Dreams Come True In Reality”. Thank You. I like the 2 pole Butterworth filter. 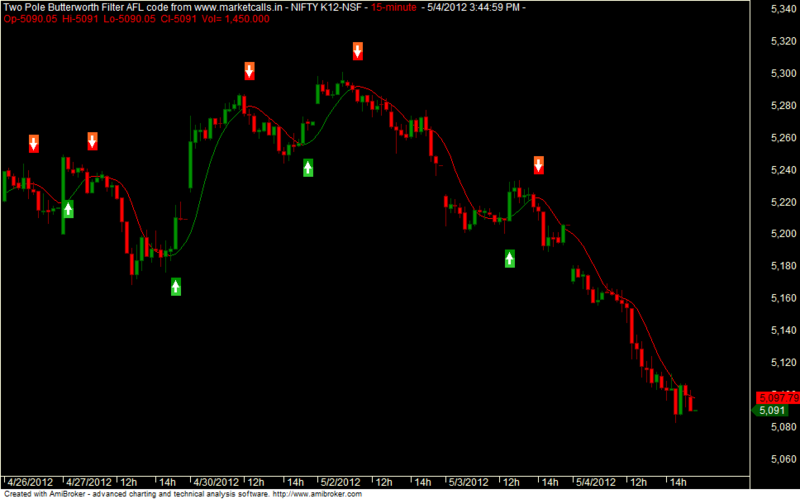 You combine it with price line is fast moving averages to generate good buy and sell signals. Or you can apply swing theory on the waves of the smoothed price. I looked up the theory on the Butterworth filter and then compared this with MA/EMA etc. This can be effectively used by swing traders as the low and high swing noise is filtered out effectively. Traders, should develop and test their strategy. nice afl ,thanks lot for sharing! sir i have a one mql4 cod , how can change for AFL, could u tell me please!! thanks a lot!! you need programming knowledge in both mql4 and AFL codes to do that. i don’t have this ,could u please convert me if u kind sir! thanks a lot!!!!!!! I am using Amibroker version 5.20, and facing below mentioned error at the time of implementation of indicator. Variable ‘tbfilter’ used without having been initialized. It is my kind request to please assist for resolution. Could you please assist, with how to proceed for resolution? Because I have tried one by one with each file code mentioned in (v3a.odt, v3b.odt) but neither of them works. If you will elaborate process step by step for resolution, That would be a great help. It would be a great help, if you can assist on query. Because I have tried one by one with each file code mentioned in (v3a.odt, v3b.odt) but neither of them works. The code is still showing error for both those files, which you have shared. I am using Amibroker version 5.20.
if you can assist, that would be a great help. Many thanks for sharing this indicator with the public. May I know why is the current candle not being painted yet? its like we have to wait until tomorrow for the indi to paint.